Today, I’m displaying my third crochet scarf for donation to the Orphan Foundation of America. 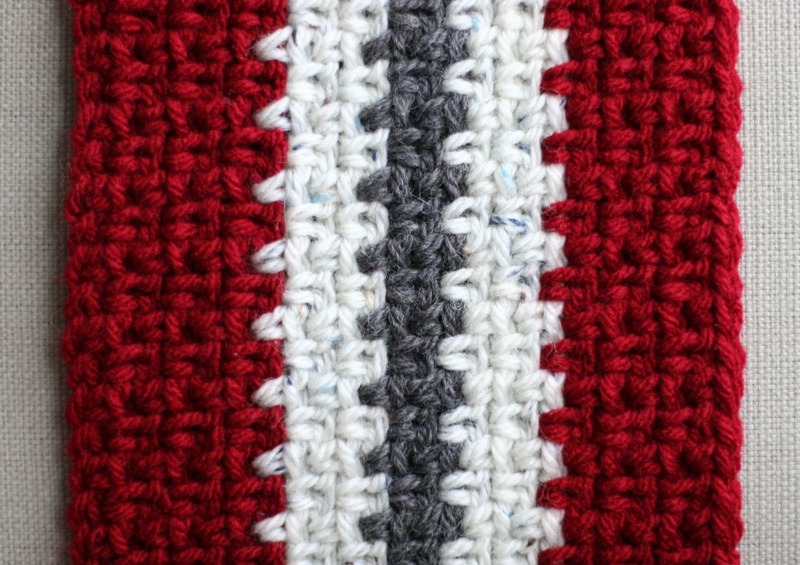 It’s a simple pattern featuring single crochet spaced apart by single chains. 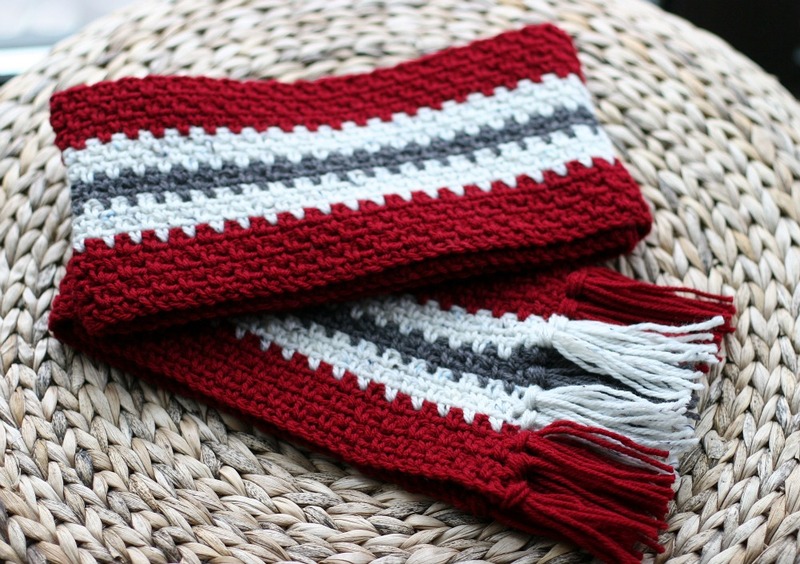 The crochet pattern creates a sleek, solid scarf that isn’t too heavy. 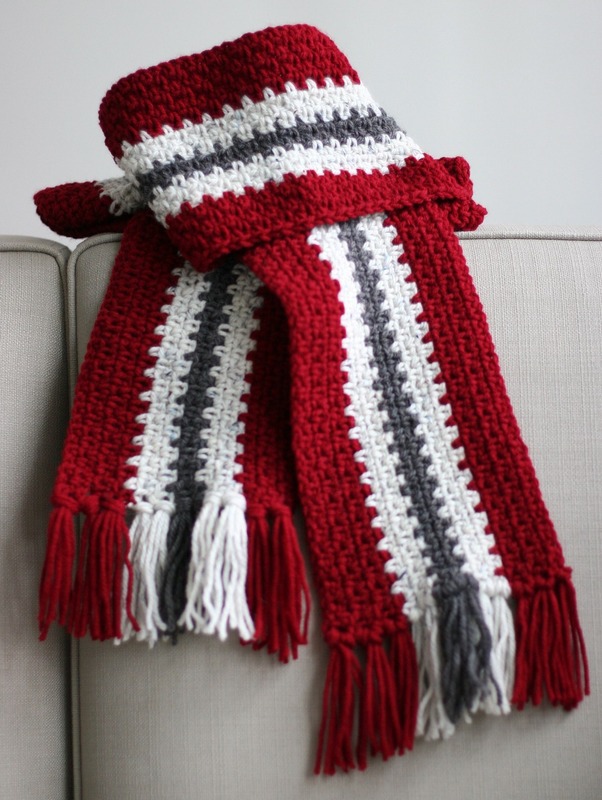 I’ve used a combination of red, ivory tweed and grey yarn to create a modern scarf for a man or woman. Since I tend to be someone who can easily start and stop projects, I worried that I might not be able to produce all five scarves as promised within the project deadline. However, I’ve been enjoying the crochet so much that I’m ahead of schedule (and already thinking ahead to future projects!). This scarf came together quickly one morning while I listened to the news on TV and occasionally glanced at the rainy day outside. Before I knew it, the scarf was complete and it was time to make lunch. When I started crocheting a few weeks ago, I was determined not to use any pattern that required me to work the length of the scarf. I like to see progress quickly and felt it would bore me to have to work such long rows. But since you can’t really create a vertically striped scarf without crocheting in long rows, I gave in. And, I think it ended up being the quickest and easiest scarf to make so far. Row 1: SC in second chain from hook, *chain 1, skip a stitch, SC in next chain. Repeat from * to end. Chain 1, turn. Row 2-23: *SC around chain 1 from previous row, chain 1. Repeat from * to end. Chain 1, turn. I finished the scarf with fringe color coordinated to each band of color. I used four strands of yarn for each tassel. I applied 3 tassels to each band of red and 2 tassels to each band of ivory. I applied two tassels to the grey band. The scarf turned out so well (and SO quickly) that I immediately started my fourth scarf using the same pattern with a different color combination. Anyone have a favorite scarf pattern that you’ve found online? I’ve looked at so many patterns but don’t find many that I like. I love this scarf and the very nice colors you incorporated in this. I too love to do verticle crochet. It is quick and easy. Thanks for your pattern. !